When it comes to seas, everyone just loves it. There’s something delightful and soothing about the chilly wind and the way the water drifts that make you love everything about being on the water. You can have a beautiful sunshine in the morning that makes you appreciate each day. And in the evening, you can gaze at the beautiful sight of the sea and the gleaming stars above you. The place is just perfect for everything that you want to do away from the accustomed city noises and hustles. Who wouldn’t love that? Undoubtedly, being in the sea is the best way to retreat and have unique recreational activities with your special someone, friend, or your family. On-the-sea recreational activities abound at Marina del Rey. But the best thing to try is cruising along the elegant harbor. Cruising is the main experience that visitors try and revisit each time they come to Marina del Rey. There, you can find Tiki Mermaid, a boat and yacht charter that can cruise you around the gorgeous Marina harbor—the stunning dominant feature of Marina del Rey. With the one-of-a-kind view it offers, the marina harbor is a great blessing for recreation. Perhaps you’re fond of gourmet cheese platters or basil and fresh feta charbroiled chicken, or you can even bring your own food and enjoy the unlimited soda-juice bar—whatever the case, you can get those salivary glands satisfied while on the cruise. Peace and calm are yours to relish now. The beautiful harbor and the sweet glide of the wind through your face will make you retreat from the world. Forget about your unfinished tasks, not everything about life is made for toiling. It’s about time to indulge yourself in something more entertaining. Make your whole cruising experience a memorable one. It’s perfectly fine to show off your old and outmoded dance moves and laugh loudly. 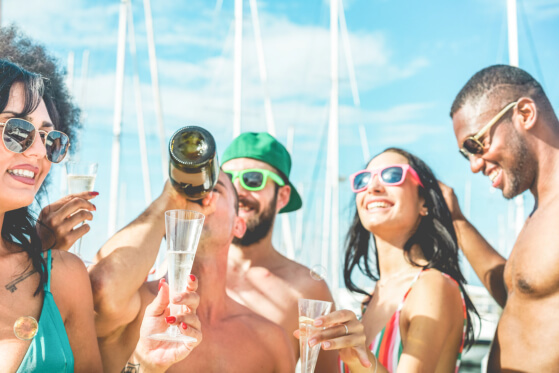 You can enjoy party cruises and private parties that can give you endless entertainment. Forget your workweek formality, it’s the best venue to get silly. This entry was posted in Harbor of Marina del Rey and tagged Cruise, Cruising Experience, Party Cruise. Bookmark the permalink.